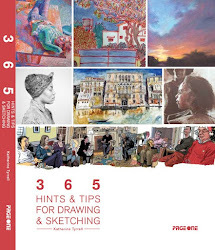 Yesterday I was featured on the new Urban Sketchers team blog and today I'm featuring an introduction to Urban Sketchers on my main blog - see Urban Sketchers officially starts tomorrow. 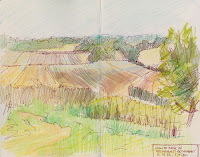 I thought I'd give readers of this blog a bit of an insight into where I'm planning to go with my posts about London plus the story behind the photo of me which appears on the Urban Sketchers post about me. 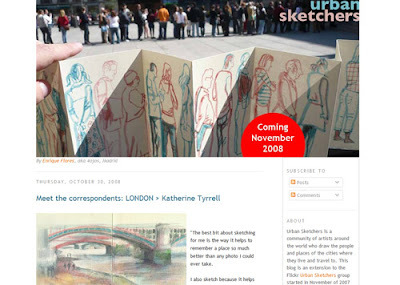 Gabi, who created Urban Sketchers, told me he needed a paragraph, a sketch and a photo of me for an introduction. I looked at all recent photos of me and concluded that although they were realistic and useful for sending to fellow sketchbloggers that I was meeting up with for the first time, they were hardly flattering. They certainly weren't blogging material. So last week I decided a new photo was needed - at which point I got the most dreadful head cold - and you all know how you look when you have a cold! So I crossed my fingers and hoped it would clear up quickly and thought about how to do a photograph. On Wednesday, I was over the worst of the cold and "he who must not be bored while I sketch" (HWMNBB) and I went across to Greenwich for the afternoon for a brisk walk in the park and an hour with the books in Waterstones. 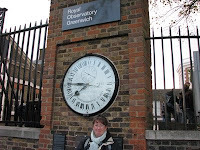 I'd had the 'brilliant' idea that since this new team blog was about Urban Sketchers I should try and get a photo of me at the top of the hill in Greenwich Park, next to the Observatory - standing on the Prime Meridian with a goodish chunk of the River Thames and London behind me. Neat idea - huh? There was a slight flaw with this plan. HWMNBB is not, he will readily admit, a photographer. But I'd already worked out how to deal with that. I'd take a photo of him to judge where I should stand and how he should focus on me. That took three photos. Then he was to take over and reproduce the shot with me in his place. We had by now gathered a small audience of teenage girls who were thoroughly intrigued by what was going on. Oh the joys of having one's photo taken in public! Fortunately I decided that it might be an idea to try some smiling (with/without teeth), non smiling and profile shots. It was a good job too! Somehow he'd omitted to mention that I'd managed to get lipstick all over my teeth ( I only usually wear lipstick for photos!) and the smiling without teeth ones made my eyes look dreadfully small with puffy bags! 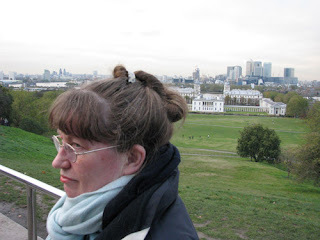 So this is me - with the River Thames and City of London appearing just above my fringe and Greenwich Park and the Queens House behind my head. Incidentally the walkways with the columns either side of the Queens House (the white house designed by Inigo Jones just to the right of my bun) is the place where the BBC filmed Amy Dorrit (for the new series Little Dorrit) walking against a backdrop of columns in the first episode last Sunday. Just behind it and next to the river is the old Royal Naval College, designed as a naval hospital in the 17th century by Sir Christopher Wren which is also frequently in use as a film set. Then beyond these buildings and on the other wide of the river you can see the new financial centre at Canary Wharf which was filmed extensively as the credit crunch erupted in Britain last month. 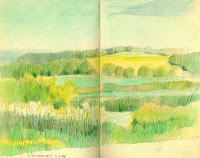 I'm thinking of trying to develop a panorama of sketches of the two sides of the Thames and wondering whether I should invest in one of those panorama Moleskines. 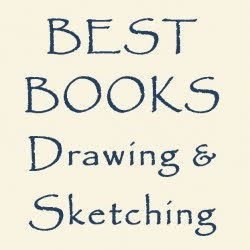 Either that or lots of separate sketches in the same format which join up. But what's the best format? I'm mulling that one over. 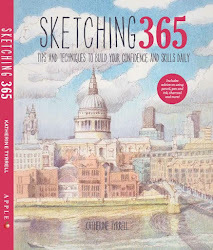 I also want to produce a book of where to sketch in London and I intend to develop a series of hand drawn maps of locations - showing places to go to sketch and what you can see nearby. I'll be reserving the maps for the book but I do already try and provide links to Google Maps for locations. I'm also going to be developing a map of locations where I've sketched - although I'm not quite sure whether I'm going to use geograph or paintmap. I'll be reporting back on my comparison of the two systems and any other options which people alert me to. If anybody has any comments or recommendations about software I'd love to hear them - please use the comments function. 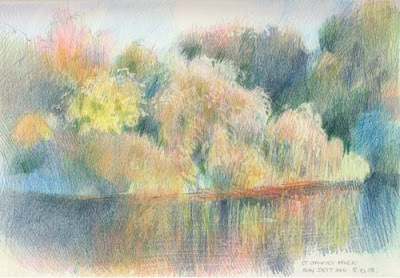 Last Sunday, I joined the RWS Friends Group for the first time on a Sketching Day and visited the Royal Festival Hall. I turned up at 11.00am duly carrying my portfolio so that hopefully somebody would recognise me as 'belonging' to their group. It worked a treat and I got a very warm welcome from Libby who was organising the day. 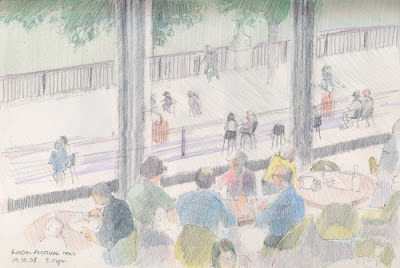 We sketched until lunchtime, then had lunch in the Riverside Terrace Cafe, followed by another sketching session after lunch for those who wanted to stay on. I went up to the fifth floor balcony at the front of the building. 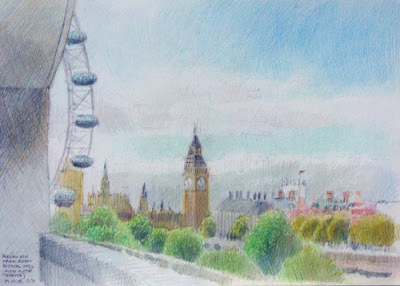 There's an excellent view of the Houses of Parliament - and a chunk of The London Eye. 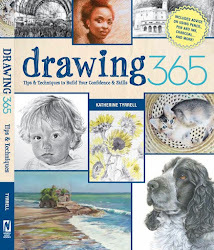 I'd taken my new large sketchbook - and I'm inclined to now think it's too large. The reason being that getting a good saturation of colour on the paper was more difficult than with the sketchbooks I normally use. I got three sketches done in total, two before and one after lunch. For the first two I was entertained by a 'salsa' band playing on the Riverside Terrace under the railway bridge. 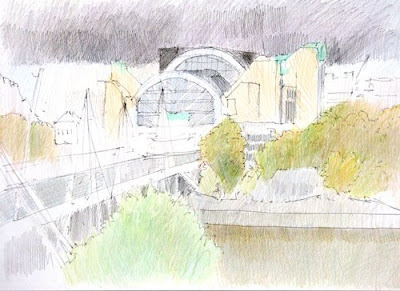 Note: You can find out more about RWS Friends on the Bankside Gallery (under supporting the gallery/Friends) and the RWS website here. Monthly sketching trips are planned - the next three will be to Somerset House, the Victoria and Albert Museum and Spitalfields. 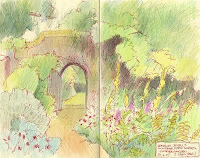 This post lists all those posts which relate to places - and gardens in particular - in the South of England outside London. Counties are listed alphabetically. The posts are then listed in the order they were published except where there are a group belonging to one place (eg Sissinghurst) in which case those are grouped together. The images all come from the posts listed. This summary will be updated periodically with posts as they are added to the blog. It will also be listed in the right hand column of this blog. I went to the RHS Autumn Harvest Show at the Horticultural Halls yesterday. This year they have incorporated a number of different shows and competitions under one roof. These include the Vegetable Container Competition and competitions including fruit and vegetable, British national carnation society and an ornamental plant competition. 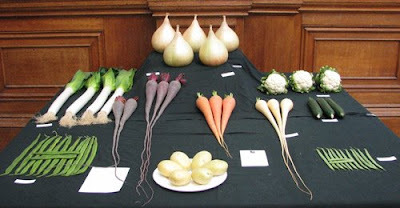 I spent quite a bit of time in the Lindley Hall looking at the best and biggest vegetables! In the main hall they had a display of photograph relating to plants and I came across a very unusual and impressive development by one exhibitor which I'll be writing more about on Making A Mark in due course. After buying some deep dark red lilies at the end of the show I then walked to the tube with these (all 3 feet of them). I was very grateful for the fact that I'd remembered this time to go to the last day of an RHS show suitably equipped with bags - which was a good thing as I decided to take advantage of the light and take the long way home via scenes of the setting sun in St James Park. Like all the parks, St James Park is a great place in central London to draw trees as you can get a good distance from them and see their forms much more clearly. Plus you also get banks of trees which look great when the colour varies across the bank. 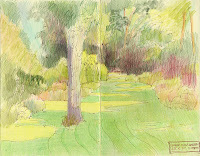 I knew the setting sun should give some good evening light on the trees but wasn't quite sure where it would look best - until I found this spot (see sketch at top). I didn't have the time to get all the colours down as the light was changing fast. 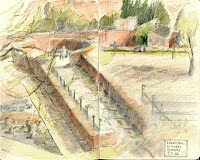 Instead I used a pencil to get the main shapes and forms down and then annotated the entire sketch with colour notes. 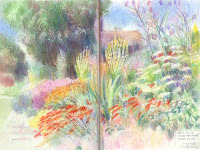 When I got home I had dinner and then proceeded to translate the colour using coloured pencils - and judicious use of the battery powered eraser for texture!